Mattia Antoniotti has joined his father Odilio at this historical 19th century cantina, back to 1860, that is tucked away in the northern Alto Piedmont village of Sostegno, in the 28-hectare region of Bramaterra among the pre-Alps. They now farm 6 hectares of Nebbiolo, Croatina, Vespolina and Uva Rara vines, the fruit of which Odilio first bottled in 1970 (prior to which Odilio was selling grissini and pharmaceuticals!). The Bramaterra DOC rules that there must be a maximum of 80% Nebbiolo in Bramaterra, and Mattia believes that the addition of the other grape varieties gives a more balanced wine, and a truer expression of origin. The Bramaterra soils are essentially volcanic porphyry, along with veins of rose quartz and limestone, and they are more acidic and arguably richer in minerals but less fertile than the soils of the Langhe, thus producing extremely pure and concentrated wines. The wines are traditionally made in cement, stainless-steel and large Slavonian oak botte, along with tonneau for the Nebbiolo wine. In the early 19th Century Alto Piemonte was a prestigious wine region, responsible for producing the majority of Piedmont’s wine, including some of the highest quality Nebbiolo in Italy. In the late 19th Century however, the vineyard area decreased dramatically due to the devastation of Phylloxera. Replanting was limited, as the younger generations were caught up in the industrial boom, thus leaving the land to work in factories. The Second World War brought further reduction in production, and vineyards began to become overgrown by forestry. Today however, things are changing. As Mattia described, there is a new injection of energy and enthusiasm from the next generation of young winemakers. Giacomo Conterno purchasing in Gattinara has also shone spotlight once more on this exciting and (re) emerging region. The focus at the moment seems to be on the key vineyards, but Mattia feels there is great potential for growth, and Alto Piemonte may well be on the path to regaining its former glory. 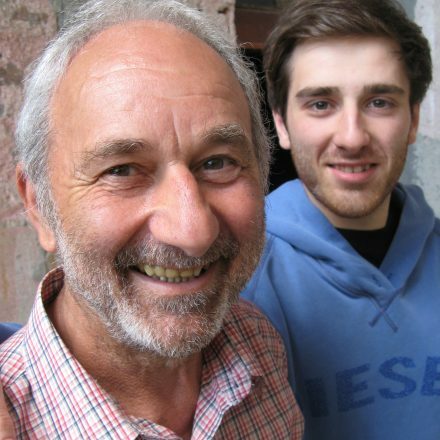 Mattia and his farther Odilio have a new project on the horizon, for a single vineyard Bramaterra – watch this space..! Bramaterra Riserva (from vintage 2015)! 2016 ‘Pramartel’ Vino Rosso, Sostegno – tasted Sept’17, April’18, and Sept’ 18 (only 2k bottled March’18), 12.5%abv. A baby Bramaterra in all but name; indeed the name is Piedmontese for the young vineyard from which this early drinking Vino Rosso is made: ‘Prato Martel’. ‘Martel’ comes from ‘Martello’ (hammer), referring to the strength of the volcanic rock that makes up the soil, and needs a hammer to break it! 2016 wasn’t a straightforward vintage like 2015 & 2017, with increased disease pressure from regular showers giving lower yields & more concentration. The 2016 is a blend of 70% Nebbiolo, 20% Croatina and 10 % Croatina (the Uva Rara suffered). Brief 1 week cement ferment & maceration (spontaneous MLF in stainless steel), aged in 300 & 500 French tonneaux. Classic vibrant purple/blueberry colour, pretty, focused, with pure kirsch/glacier cherry fruit, notable fragrance, lift of white pepper, energetic redcurrants, and gentle spice. Fine tannins on the palate – less structured than the Nebbiolo Costa della Sesia, but with some complexity. 2015 Nebbiolo Costa della Sesia, Sostegno – tasted Sept’17, April’18, and Sept’ 18 (c. 3k bts produced, bottled Oct’ 17), 13% abv. 100% Nebbiolo from 10 year old vines. Longer 2 week cement maceration, then aged in 17HL botti grandi (& one 500 litre tonneaux). 2015 was a great vintage for the Antoniotti family in Bramaterra, an easy, clean one with plenty of sun, but also a rain shower every now & then. Glistening rose/red, fragrant frutta bella, gorgeous perfume, seductive but pepper fresh, accessible yet complex, water-pure, strawberry ice-cream, racy, wild strawberry, firm but fine tannins, well integrated, energetic. 2015 was the first year they made a Bramaterra Riserva! 2015 Bramaterra, Sostegno – tasted Sept’ 18, bottled early August 2018. 14% abv, a blend of 70% Nebbiolo, 20% Croatina, 7% Vespolina, 3% Uva Rara. Mattia recalls his excitement at the time of bottling, as the wine’s perfume was so intense, 2015 being a warm vintage that gave perfectly ripe fruit. Vinification involved 3weeks maceration on the (thick) skins, followed by the usual cement fermentation (undergound), and then 3 years in Slavonian botti grandi, lending gentle framing. The nose reveals notes of rose, wild raspberry, gentle spice and cedar, leading to beautifully silky tannins on the palate, and plenty of charm and ‘gioia’, so drinkable now, and yet also with great ageing potential. 2014 Bramaterra, Sostegno – tasted in Sept’17 & April’18, 4.6k bottled in Oct’17; 13% abv; a tricky vintage that naturally reduced the yield by 50%! Indeed much damage was incurred in 2013, as a result of hail, that then influenced the vine’s performance in 2014. Yet the fruit there was, was ‘buono’, of sufficient ripeness &skin/phenol maturity to warrant 3 wks maceration in cement, followed by 24 mths ageing in botte grande. Antoniotti’s Bramaterra 2014 recalls Cote Rotie, in its coolness & fragrance perhaps. Fragile, vulnerable even, smoky kirsch cherry perfume, sotto spirit certainly, delicate fruit tannins, not the longest of Bramaterra but fabulous. 2013 Bramaterra, Sostegno – normal summer, broken only by grapefruit sized hailstones (!) that landed on 3rd Aug, causing 51% damage to the vineyards (& blasted 270 roof tiles! ), otherwise harvest started on 10 October; blend of Nebbiolo (85%), 15% Croatina, Vespolina, Uva Rara, s/s ferment then botte grande (8/10 yo). very fine, focused, knife like, vertical, apline herbal/Ricola (!) fruit, tight red fruit, in bocca: fragrant, electric spearmint, ovely tea leaf lift. Complimenti! 2009 Bramaterra, Sostegno – tasted Sept’ 18. Same blend as the 2015 (70% Nebbiolo, 20% Croatina, 7% Vespolina, 3% Uva Rara). Earthy, concentrated, with notes of tea leaf, kirsch, crushed/dried rose petals. Darker and more brooding than the 2015 Bramaterra, yet very elegant, with subtle notes of cedar and clove, and layers of complexity that unravel slowly in the glass. Tannins are prominent but very fine (the grapes undergo 2 weeks maceration on skins, before fermentation in cement). 2009 was a balance vintage, with a cold winter giving respite to the vines, and then a relatively mild Spring and Summer, before a warm September. 2001 Bramaterra, Sostegno – tasted Sept’ 18. Mattia describes 2001 as a great vintage, and likens it more to 2009 than to 2015, with its mild winter, warm Summer, and cool September, allowing for slower and longer ripening before the October harvest. Pale garnet with orange highlights. Delicate perfume of dried fruit, mulberries and cherries sotto spirito, a hint of concentrated Christmas cake and spice, then opening to reveal more herbal notes as it relaxes in the glass. Tannins are silky and extremely well integrated. Expansive on the palate, with length that goes on and on, compelling. 1985 Bramaterra, Sostego. Tasted Sept’ 18. This was the wine served at the marriage of Odilio and Piera Antoniotti! Very enticing scent, somewhere there is the essence of a spirited Summer pudding once bright with fruit, but that has been left to rest, to absorb all its flavour, becoming spicier and more concentrated with time, and layered with complex tertiary notes of dried berry fruit, cinnamon, a hint of liquorice and tea leaf, interwoven with elegant tannins, and upheld by a remarkable freshness that persists even now. Perfectly balanced, sensational…. especially with Taleggio!